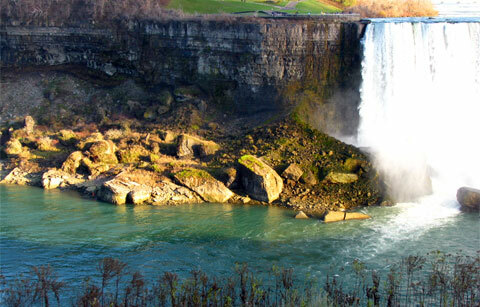 THE FIRST TIME I saw Niagara Falls it was during the summer months. I never gave a thought as to how it would look during the colder months—it just seemed like a summer activity. But when my mother-in-law Sandi came to spend Thanksgiving with us, taking her to see the Falls was the ultimate day trip we could think to give her. She lives in Texas and was not going to have a reason to visit Niagara any time soon from her home base. So, what’s a little brrry weather when you can see one of the great sights of the world? We drove the three-and-a-half hours from Youngstown, Ohio to the Canadian side of the Falls (our preferred side) on the day before Thanksgiving. We predicted that the family-oriented holiday where most people want to be at home would give us an advantage over the usual tourist hordes and sitting in lines at the border gates. And we were right. Contrasted with the swarming crowds of American, Canadian and international faces you see at the Falls during the summer, this was pretty sedate. But we liked it. It matched the more sombre mood of the Falls produced by the chilly season. One thing I loved about seeing the Falls in the summer was being able to watch the cheery Maid of the Mist tourist boats ply back and forth between American Falls and Horseshoe Falls. (Passengers wear rain gear to try to avoid getting totally soaked at the foot of Horseshoe Falls.) Disappointingly, the boats were already in dry dock in anticipation of the the ice bridges that form across the river during winter. 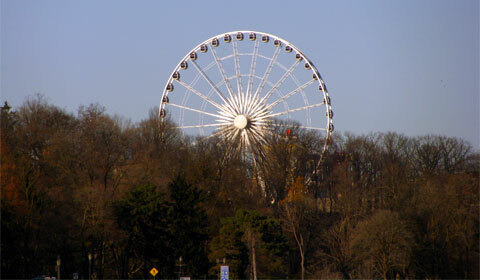 Surprisingly, the Ferris wheel was still operating—but I wonder how many brave souls paid to feel their faces in the wind at that height. We noticed that the hardy types were also still prepared to put on wet-weather gear to get as close to the falls as they can. 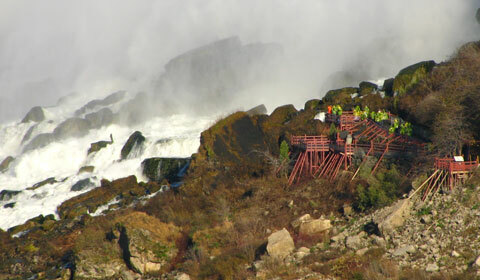 Special viewing platforms are provided at the bottom of both falls for this purpose. Naturally, you can’t go to the Falls without going crazy with your camera. This time, though, I let Brian do all the picture-taking, which meant I could relax and soak in the experience of seeing the Falls in such a contrasting season. 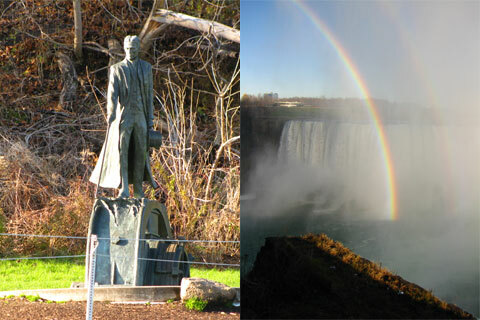 One of our biggest delights was the double rainbow that graced Horseshoe Falls the entire time we were there. I enjoyed watching my mother-in-law taking pictures to her heart’s content. She’s an artist and she kept exclaiming about the way the bare tree branches looked against the water and noticing other visual subtleties that perhaps the average tourist misses. 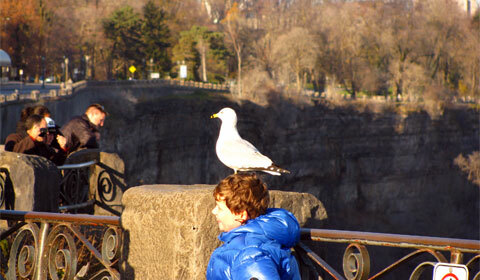 We also had a great time watching people pose with a seagull standing on one of the rock pillars that holds the railings in place. This patient and rather austere character was not at all like some of the silly ones you see. He acted as if it was his job to pose for photo ops and he was going to do so in a dignified manner. Just like Northern Ohio where we live, the grass was still a vivid green—which looked almost strange against the bare branches of the trees and scrub along the banks up behind Horseshoe Falls on the Canadian side. Brian was hoping to get a photo of himself standing next to the Nikola Tesla statue, which he didn’t get a chance to do the first time we visited Niagara. Brian’s an engineer and a fan of Tesla, having read several books about him. Sadly, they had the statue roped off. Nikola Tesla designed the first hydroelectric power plant at Niagara Falls, New York which started producing electrical power in 1895. This was the beginning of the electrification of the United States and the rest of the world. Today, Tesla’s AC electricity is lighting and powering the globe. Nikola Tesla is the genius who lit the world. After dinner at Macaroni Grill a few blocks from the Falls (not recommended; this was the only time I’ve been disappointed by Macaroni Grill), Brian went down the hill to get his Jeep to save his mom from having to walk back to the car. He was gone a long time and we were starting to wonder what happened. But we were glad later when he showed us the night-time photos he took during his detour. 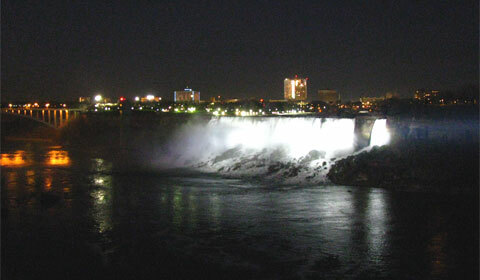 Horseshoe Falls at night. The plume looks almost ghostly. This is one of the places I’ve always wanted to go but the timing has never worked out — your photos make me want to go even more! What a fun day trip! 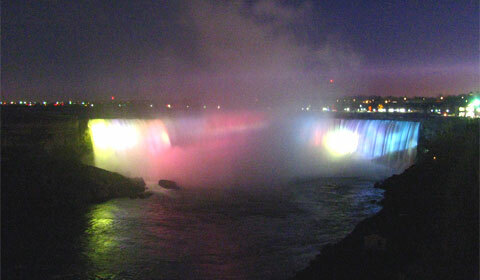 The lights are amazing on the falls! And I KNOW the Tesla monument would be one of my MEH’s favorites too! Julia, glad the photos are inspiring you to want to go even more. Brian’s photos make me want to go back again! I smiled about our MEH’s being so interested in the Tesla monument. From what Brian has told me about him he was truly a genius . . . and extremely eccentric. This sounds like a stellar trip Milli! Great article and great photos, Brian! Isn’t it great to travel to places at times when most people aren’t there? 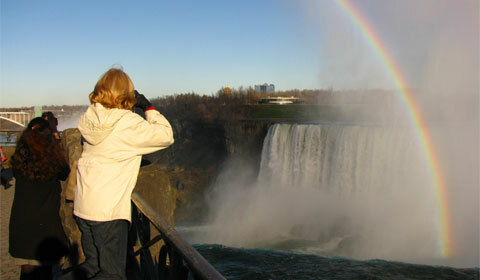 I was kind of heading to Niagara Falls on a no-itinerary trip with my daughter. 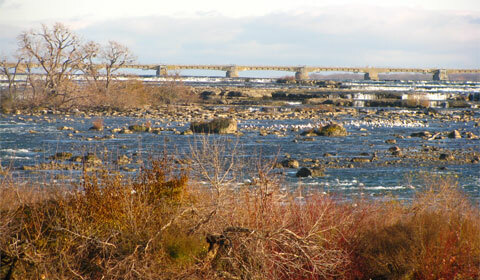 We decided to head east-northeast instead of north and ended up in Maine on that trip! 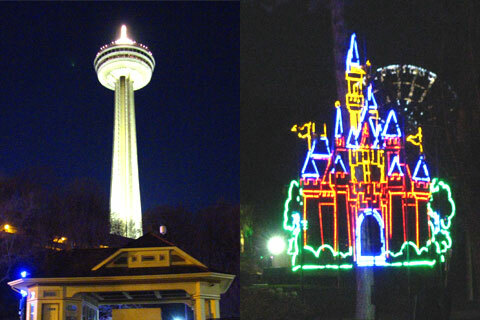 Your Niagara articles make me want to keep it high on my list of places to experience. 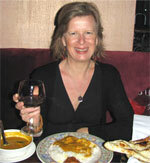 Hi Terri – Getting sidetracked to Maine on the way to Niagara doesn’t sound like such a bad deal. 🙂 I’m very pleased to know you’ve enjoyed both my Niagara articles and that makes you want to keep it high on your list. That makes it all worthwhile! I enjoy Niagara Falls anytime of year. Its beautiful with the colored light on them at night, isn’t it? 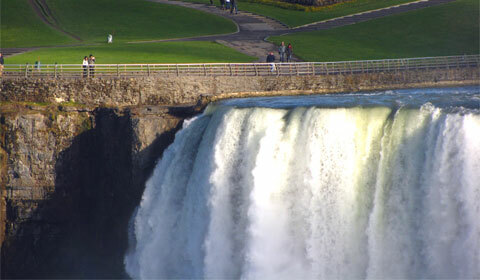 Betsy, it’s great living within driving distance of the Falls, isn’t it? I wonder how many times you’ve been there. Sounds like you’ve seen it in all seasons. Wow! 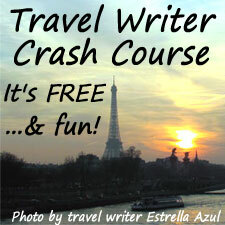 What beautiful photos and a fun post! Being a warm weather lover, I would most definitely visit during the summer! 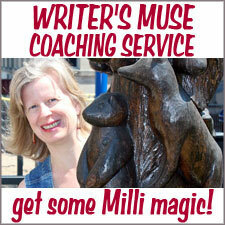 How cool is that – the Maiden of the Mist parked in dry dock like a car? Thanks for sharing, Milli! 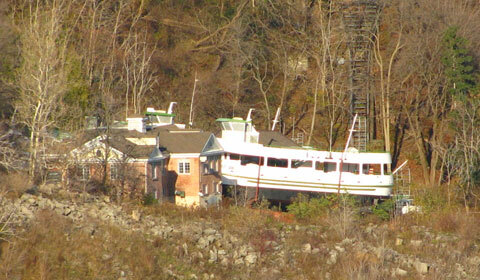 Annie ~ I’m pleased you like Brian’s photo of the Maid of the Mist in dry dock. I did not even realize it was down there until I saw his photos . . . and I thought I looked at everything! 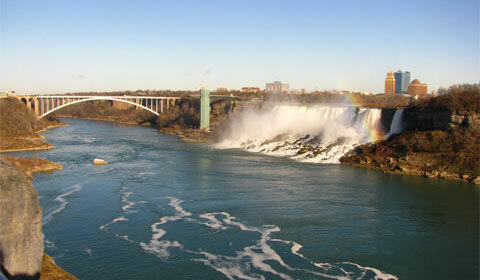 I hope you get to cross Niagara off your bucket list soon. It’s just too awesome for words to stand across from all that water moving at high speed and feel the mist drifting across from Horseshoe Falls and landing on your cheeks. Now all you have to do is go back to the falls in the dead of winter to see the changes in beauty then! The falls really are spectacular and I must say I do prefer them in low season — among other reasons because it’s easier to get pictures. 😉 And Brian got some amazing ones! Lovely post, and a lovely gift to your mother-in-law on her visit to see you. Lisa, my thoughts exactly. Now that I’ve seen it during autumn, I’d love to see the Falls during winter when (I’ve read) it gives the appearance of being frozen. I have never been to Niagara Falls. I would love to go. I am happy to hear that winter is just as fascinating. It looks just a beautiful. Thank you for posting on FB about this. Seems like there are more blogs (to read) than time to read them in! Thanks for the reminder. I really enjoyed my virtual Niagara Falls trip! Terre, lovely to see you! 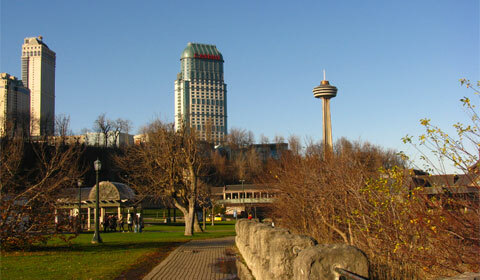 Thanks for reading my Niagara post and I’m so please you enjoyed it. I hope you get to visit the Falls someday. Totally worth it and not one bit overrated.